There is nothing inherently original about Hart's War, and contrary to its promotional trailers and television advertisements, it is not a big war movie shoot-em up. Hart's War, based on the novel by John Katzenbach (which is based on his father's experiences in World War II) is a classic prison escape movie, in the style of Stalag 17 or The Great Escape. 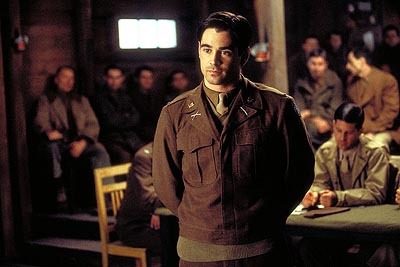 It is also a chance for a wider audience to see Irish actor Colin Farrell (American Outlaws, The War Zone), who wowed critics in Tigerland. Bruce Willis is in the movie too (he's the main character if people believe the ads) but this is Farrell's movie. Not a great movie, but a nice wide introduction. Farrell is Lt. Thomas Hart, the son of a Senator. This status keeps him out of combat, but he still ends up in a German concentration camp. Colonel William McNamara (Bruce Willis, Bandits, Unbreakable), the ranking U.S. officer in the camp. The German officer in charge of the camp, Col. Werner Visser (Marcel Iures, The Peacemaker, I Hope...) split the camp amongst Russians and Americans. The Russians work for a munitions factory, while the Americans idle. To Hart's dismay, McNamara does not place him with the officers, although there is extra space. McNamara stations him with the enlisted men. To make matters worse, McNamara places two black officers with Hart, which inflames tensions with the soldiers. This leads to a murder, first of one of the black officers, then of Staff Sgt. Vic Bedford (Cole Hauser, Pitch Black, Tigerland), an unabashed racist. The other black officer, Lt. Lincoln Scott (Terrence Dashon Howard, Glitter, Angel Eyes) is the primary suspect. McNamara convinces Visser to allow them to hold a court martial, and assigns Hart, a second year law student, as Scott's counsel. It takes a while to get to this point, but now, Terry George (The Boxer, Bright Shining Lie) and Billy Ray's (Legalese, Volcano) adaptation picks up in intensity. Hart must participate in a tense trial that he believes already has an outcome. He is not sure if McNamara has a bias against Scott, but it sure seems like it. McNamara also has a cordial yet tense relationship with Visser, which affords him a large amount of freedom. Visser offers his help to Hart, perhaps to annoy McNamara. Hart just does not know Visser's actual motivations. Hart also feels ill prepared as a lawyer, and does not have the trust of Scott. In actuality, McNamara is plotting an escape, with the trial as a distraction. This is not a spoiler, it's in all the trailers. 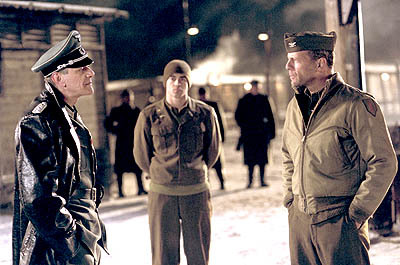 Hart discovers this and faces a moral dilemma; is it right to trade the life of Scott for the freedom of other soldiers? The main thing hampering Hart's War is its familiarity. Director Gregory Hoblit (Frequency, Fallen) does a decent job at keeping the courtroom tension high, and for a minute, it actually looks like the ending may be ambiguous. Willis' acting is a little too stoic to be of any use. He lords over everybody else, acting mysterious and answers questions evasively, as his character should. It's just not that interesting. Farrell is better, but his character is also on autopilot. He carries the movie with his role as a neophyte rising to the occasion. And just because the movie is familiar doesn't mean that it's bad. Hart's War is the same movie people have seen before, but it is enjoyable watching something familiar, even though the outcome is a given. 2 hours, 5 minutes, Rated R for strong war violence and language.